Summer is coming to a close. It’s been fun but I am very much looking forward to fall and all the colors, sights and smells that come with it. Many see Labor Day weekend as the end of summer, I look at it as the kick off to fall. It’s my green light to break out the sweaters, light a warm and cozy candle and start decorating. 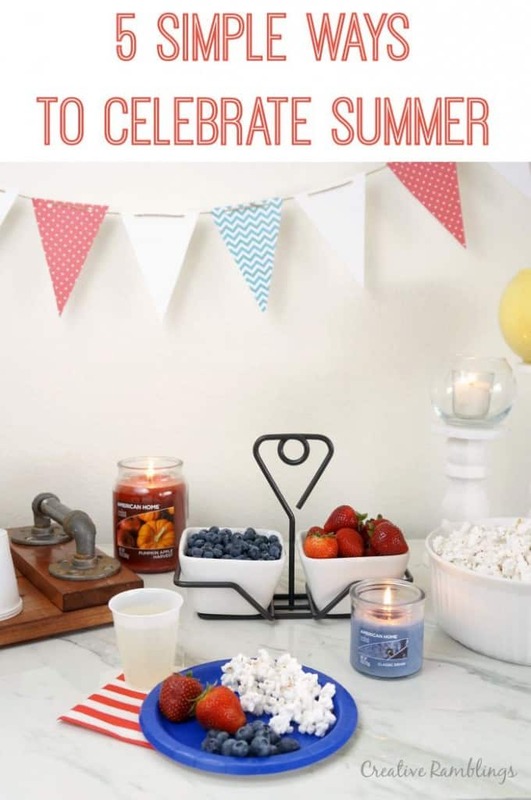 Today I’m sharing 5 simple ways to celebrate Labor Day, whether you are celebrating summer or fall these tips will help you throw a simple laid back party that everyone will enjoy. 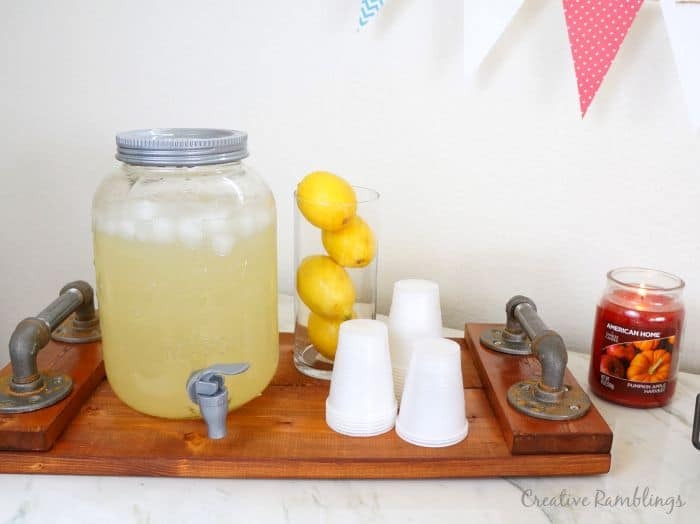 When I throw a party I like to keep things simple, a theme that’s runs through most things I do. I want to enjoy my party as much as my guests, so simple food and decorations are a must. Simple Food. I love an elaborate well plated dish at a party, they typically taste amazing and are a great conversation piece. I know the host probably spent hours putting it all together and won’t get to enjoy it as much as her guests. I prefer to stick with simple fresh crowd pleasing snacks and something yummy on the grill. For a Labor Day theme try red white and blue finger foods and tried and true American food on the grill; burgers and brats. Simple Drinks. A signature cocktail and elaborate drink stations are fun (I’ve done them before) but again require a lot of work and up keep. Someone usually needs to be restocking the station or making drinks. I prefer to stick with serve yourself style drinks like fresh ice-cold lemonade. Set up on a cute tray it can be pretty too. Simple Decorations. If the day is nice most guests will be outside for a Labor Day party. I like to decorate minimally and let nature do the rest. A few table cloths and paper banners look great at any party. Choosing fresh food and drinks helps liven up a table too and can double as decorations. Simple Entertainment. Labor Day is all about relaxing and taking the day off. I like to let guests enjoy each other’s company and let kids run and play in the yard. 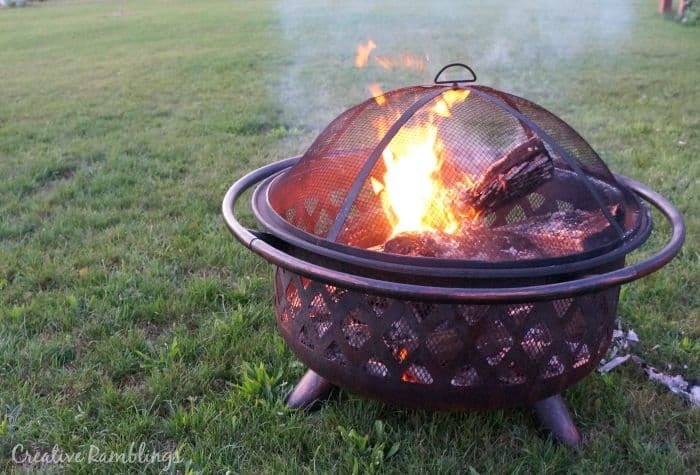 We are big fans of bonfires and often use them as our entertainment when guests come over. Eat and drink in the evening, and when the sun goes down light a fire and roast some marshmallows to keep the party going. Simple Tablescape. You could throw a bag of popcorn on the table and a couple of plastic crates of berries and call it party. 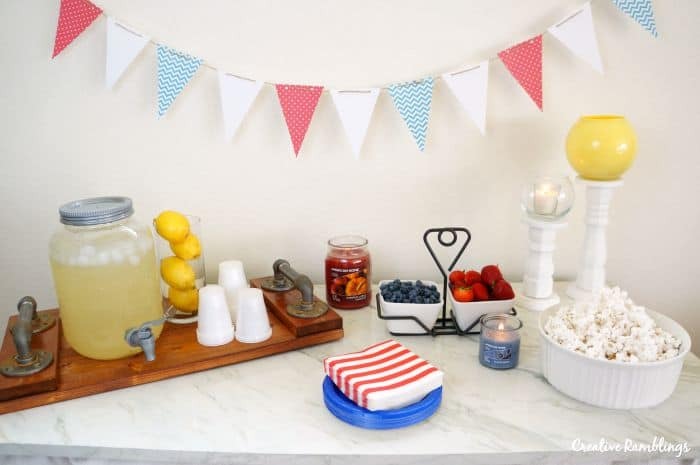 But pulling food drinks and decorations together into a cohesive tablescape really takes the party up a notch. Plus, it doesn’t take that much effort! I prefer to use what I have on hand to put together a party table. Simple white dishes, a few accessories from my mantle and candles to create a warm inviting glow. 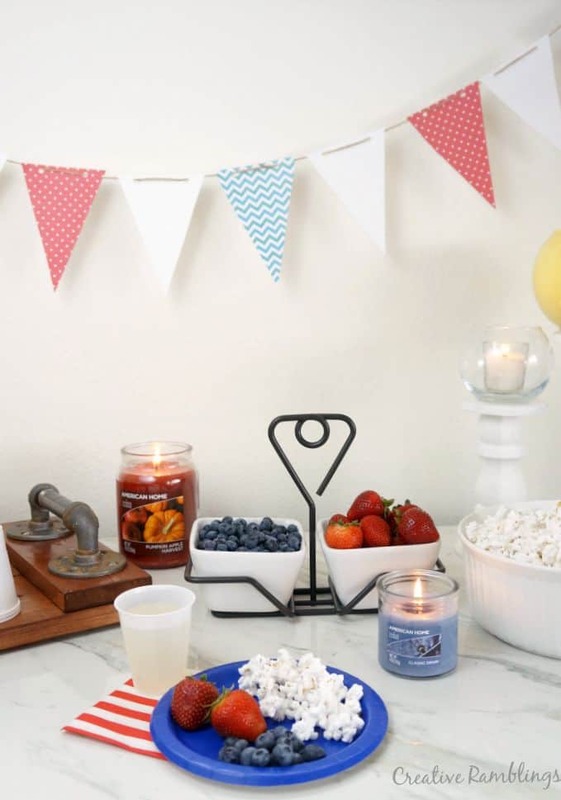 This Labor Day I chose to decorate with candles from the new American Home™ by Yankee Candle® brand just released at Walmart. I am a big fan of Yankee Candle® but a trip to the mall with 2 young kids literally takes hours and frankly wears me out. The convenience of driving 5 minutes down the road for a quality candle in a fragrance I love is very exciting. 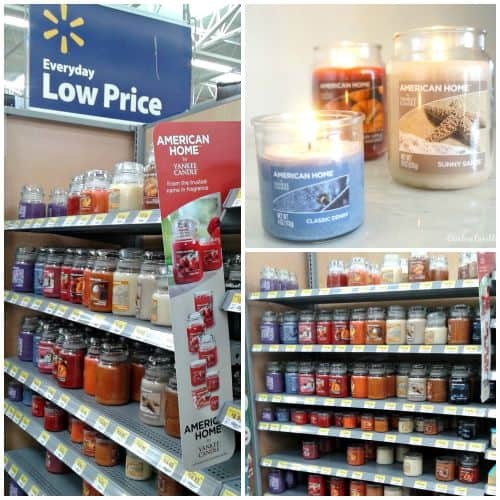 This new brand can be found in the Home and Candle section of Walmart, typically by the craft and party aisles. They have a variety of sizes and types. For this party I picked up 3 products. Two 19 oz large apothecary jar candles in Pumpkin Apple Harvest and Sunny Sands. These large jars are just $14.93 each. I also grabbed a small blue 4oz tumbler in Classic Denim for $4.93. You can view all the products here. Remember to always burn candles with care and keep out of reach of children. At these prices I didn’t feel bad spending a few extra dollars on colorful plates and napkins for the party. 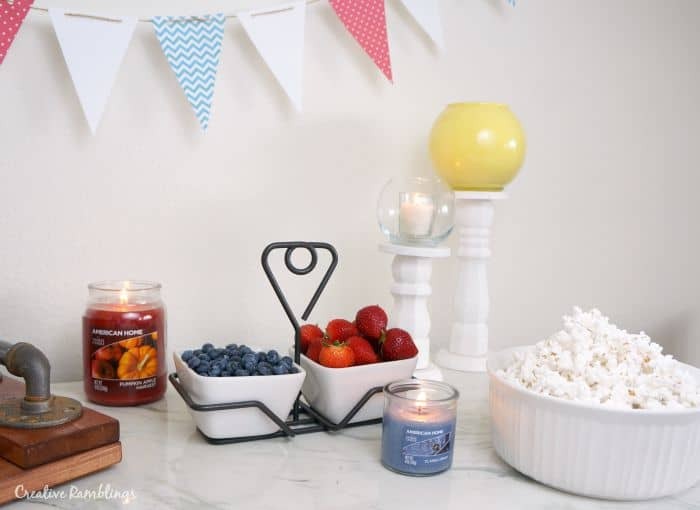 If you are shopping in store this week, be sure to grab the in store circular that highlights the American Home™ by Yankee Candle® brand along with other great Labor Day must haves. I am looking forward to a simple relaxing Labor Day celebration this weekend and I am sure my guests will enjoy it too. How are you celebrating Labor Day? Tell me about your plans in the comments, and have a fabulous weekend! Have a great weekend, and enjoy those candles!